An eight-level behemoth parked at the intersection of San Vicente and La Cienega, the Beverly Center has never exactly enticed as a dining destination during its three decades. That is, until the arrival of Cal Mare—the shopping mall’s ritzy new street-level restaurant that debuted as part of an ongoing $500 million renovation. With its 8,200-square-foot dining room and wide-open kitchen, the grand palace of Italian seafood wouldn’t be out of place in Manhattan or Vegas (dinner at the mall has finally caught up with the $5,000 Mont-blanc watches sold upstairs). The transporting space nods to Italy’s Amalfi coast with white brick walls giving way to ocean blue subway tile, bougainvillea branches hanging from a wooden trellis, and a fireplace warming the outdoor patio. Adam Sobel, a Long Island native who ran restaurateur Michael Mina’s Bourbon Steak in Washington, D.C., and Mina’s RN74 in San Francisco, helms the kitchen, directing traffic from the counter while clam pizzas sizzle inside a dome-shaped brick oven and knobs of Monterey squid are stuffed with spicy ’nduja sausage and suprêmed Valencia orange. It’s all part of a polished operation. Decorated sommelier Rajat Parr, another member of the Mina Group, has stocked the wine list with pulsating whites from Sardinia and Sicily. Grilled branzino is filleted table-side with flourish, and a limoncello cart makes the rounds, offering puckery digestifs. The menu is lengthy, but its highlights are coastal. Thick lozenges of amberjack are sprinkled with fried capers and cherry peppers, and a sluice of fruity olive oil brings the fish’s silkiness into focus. 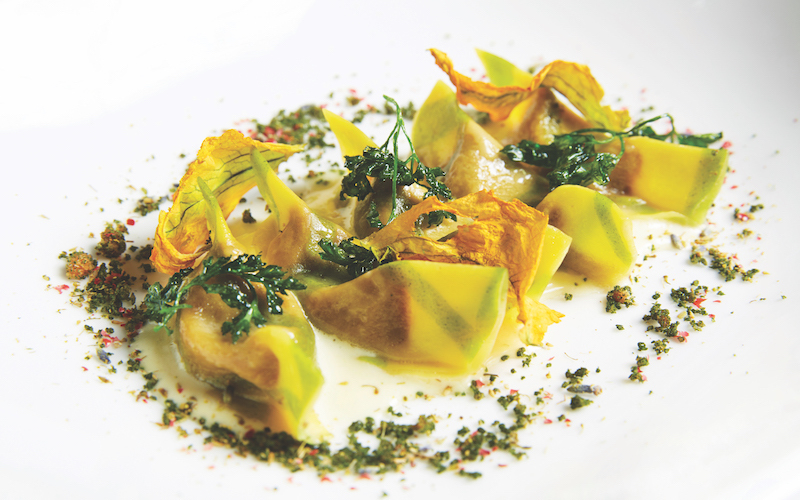 Crunchy fried blowfish tails (“chicken wings of the sea,” one manager calls them) dabbed with salsa verde are satisfying snacks, while tender squash-filled agnolotti bring out the briny sweetness of truffled sea urchin sauce enhanced with Dungeness crab. But the opulence of Cal Mare is best captured in the restaurant’s signature bite: a warm zeppole stuffed with mozzarella di bufala, caviar, wildflower honey, and a near-translucent sheet of prosciutto. If this is the future of mall food, brace yourself. Cal Mare, Beverly Center, 8500 Beverly Blvd., Beverly Grove.